View More In Mixed Drinkware Sets. Posh Five Scotch Glasses Set Is Redefining Your Whiskey Enjoyment! Can't wait to get home after an exhausting day and unwind with a flavorsome whiskey glass? Looking for an elegant set of scotch glasses for the upcoming bachelor, bridal or graduation party? Is your best friend's birthday round the corner and you're in search of a gift to remember? Well, your quest is ending here! Posh Five has released the perfect blend of quality, design and durability in a COMPLETE set of 6 Glencairn Glasses + 4 Whiskey Stones! 6 Crystal Clear Scotch Glasses Designed For Peerless Whiskey Enjoyment! 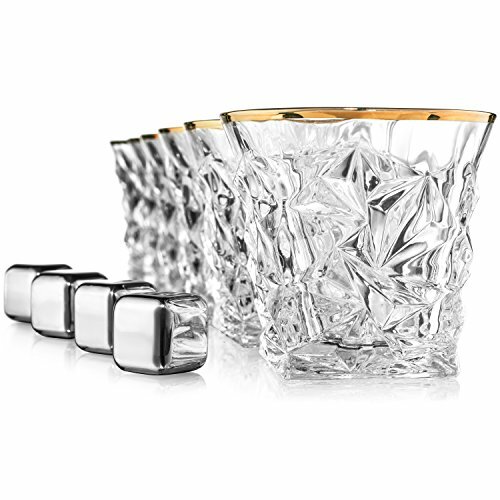 Feast your eyes on the exquisite diamond design, hold in your hand the 280ml whiskey glasses and let 9oz of your flavorsome whiskey rejuvenate your senses! 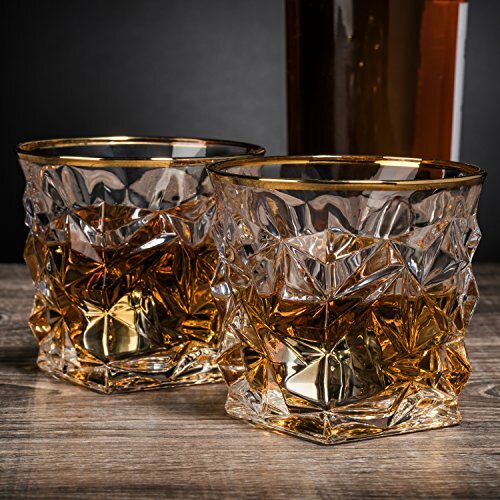 Hand-blown from superior quality lead-free glass, this set of whiskey glasses is designed to take your whiskey, bourbon, scotch cocktail or dram to a new level! Upgrade Your Restaurant Or Home Bar! Add a touch of style to your kitchen shelves, restaurant, hotel or bar décor! 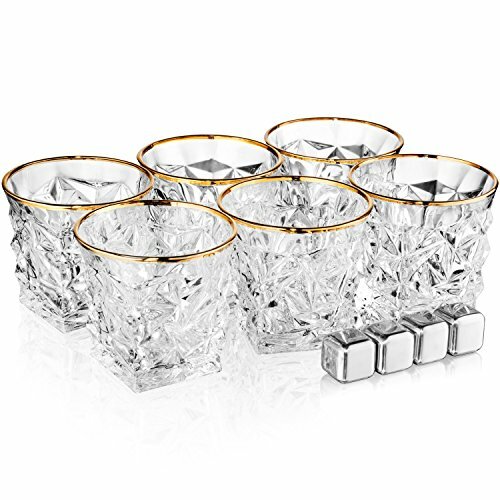 The luxurious design, gold rim scotch glasses and the stylish Stainless Steel whiskey stones will breathe into your bar quality, elegance and class that won't go unnoticed. Treat a loved bourbon or whiskey lover to an unforgettable gift! Offer them Posh Five scotch glasses set as a birthday, wedding, housewarming or impulse gift and enjoy their ear-to-ear smile! Stylish, sturdy and dishwashersafe, our set will make the best token of your feelings on all occasions! Get Your Set Today Risk-Free & One More For Your Family Or Friend! Click Add To Cart NOW As Supplies Won't Last Forever! -*We reccomend hand washing these beauties as a best practice. TREAT YOUR GUESTS LIKE ROYALTY with an exquisite set of scotch glasses offered by Posh Five. 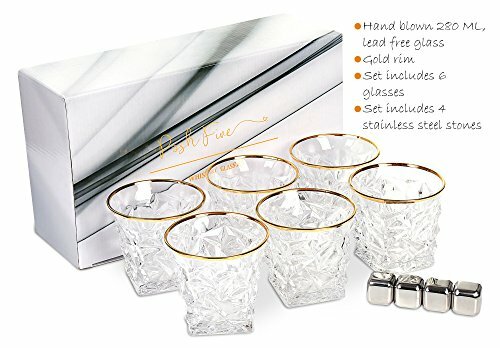 Take their aromatic whiskey sipping to a whole new level with the ultimate stylish whiskey glasses kit of the 6 diamond Whiskey Glasses + 4 Whiskey Stones; a TREMENDOUS VALUE set offered at an unbeatable price. GET THE SUPERIOR QUALITY THAT YOU DESERVE! 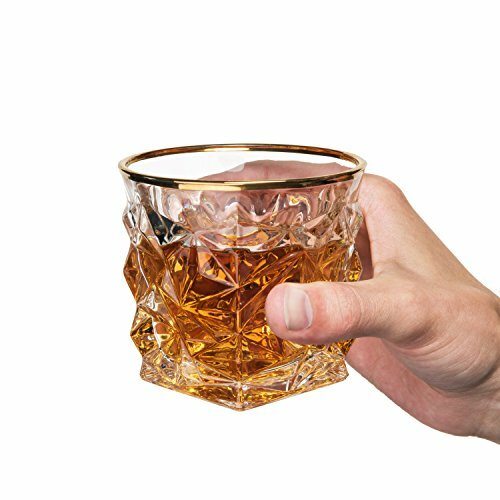 Hand-blown to perfection from lead-free glass, our 280ml whiskey glasses come in the ideal weight for your convenient use. 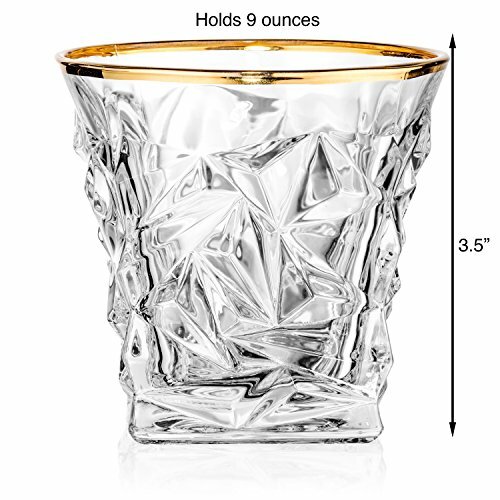 Crystal clear, 3.5" tall and with a 9oz capacity, they are designed for your whiskey enjoyment. 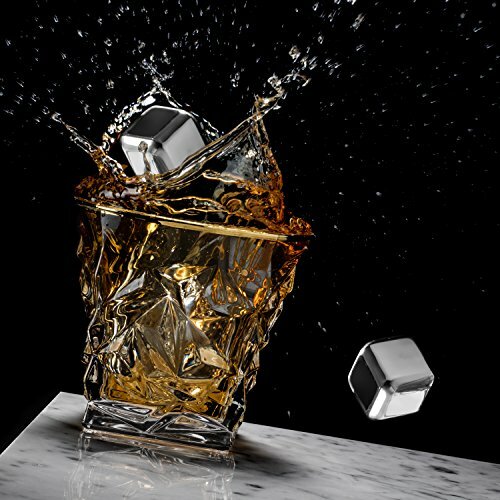 And the Stainless Steel Whiskey Stones will upgrade your sipping pleasure! DELUXE DIAMOND DESIGN! Breathe classy air into your home, hotel or restaurant bar with a luxurious, eye-catching, gold rimmed glencairn glasses set! Perfect for your relaxing night whiskey sipping and the special wedding, birthday, Christmas, bachelor or Thanksgiving party, it will make hot conversation topic among your guests! A STUNNING GIFTING IDEA! Treat a loved whiskey lover to a gift to remember! 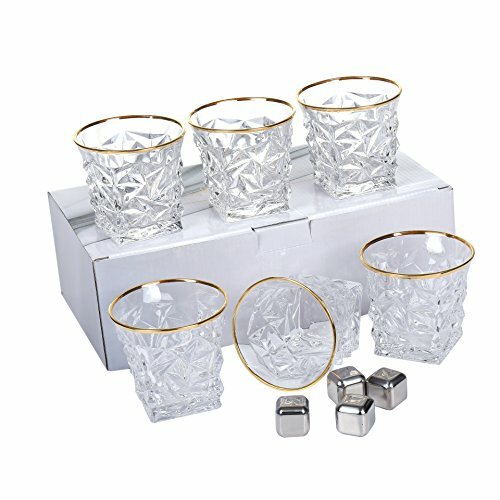 Stylish, sturdy and coming as a COMPLETE set with the 4 Whiskey Stones in a deluxe Gift Box, Posh Five scotch glasses set make the best gift on all occasions. 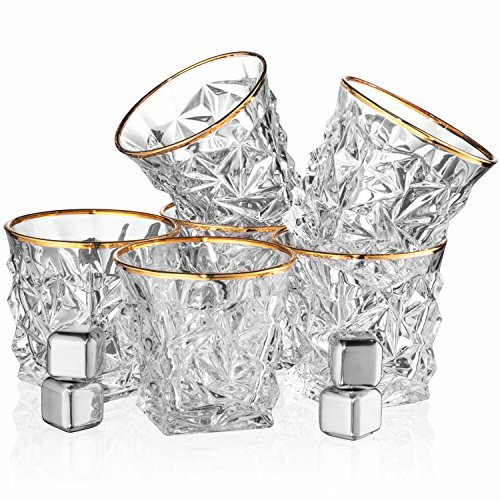 Show off your excellent taste with the best diamond whiskey glasses set on the market! YOUR COMPLETE SATISFACTION IS GUARANTEED! We walk the extra mile to ensure our valued customers' complete satisfaction, this is why we back our scotch glasses with 100% Money Back Guarantee. If you are not absolutely thrilled with them, just let us know and we will issue a fast replacement or full refund- HASSLE FREE! If you have any questions about this product by Posh Five Trading Co, contact us by completing and submitting the form below. If you are looking for a specif part number, please include it with your message.